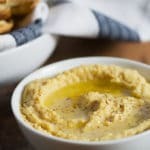 Sophisticated but easy homemade hummus recipe with garlic, a little lemon, and plenty of truffle oil. It’s like no other hummus you have tasted and you will never want it any other way! Served with these herbed pita chips, its a great little appetizer recipe for a party. Debbie and I love our hummus. Great as an everyday snack or as an appetizer for a party. This hummus recipe in particular is perfect for a party cuz it’s all fancied up with truffle flavor. 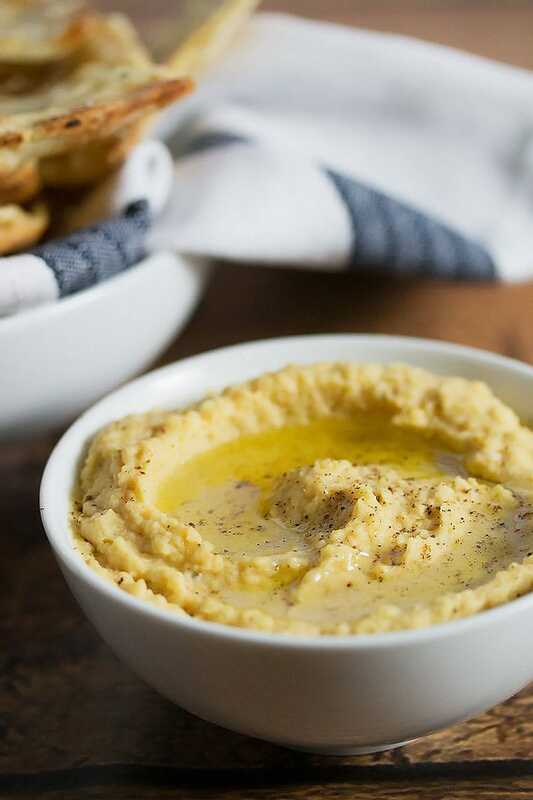 If you like truffles and you like hummus, you are going to love this recipe! Even my husband liked it and he’s a hard sell for new things. Along with this hummus recipe we made some baked pita chips as well, since those are also way better homemade. These are so easy and way more flavorful and healthy than their store bought and deep fried counterparts. They only take about 6 or 7 mins in the oven and they get just as crispy. You’ll never buy pita chips again, I tell ya. What goes in a hummus recipe? If you are going for a truffled hummus then I wouldn’t add any other flavors to this hummus recipe or you might overpower the truffle flavor. A word about the truffle oil: all truffle oils are not created equal. Some oil is made with synthetic flavors and they have varying potentcies. 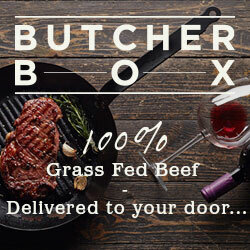 Look for one that uses real truffles and is steeped or has shaved truffles. If you get a good one, you will not need to use 1/2 cup of truffle oil to get the desired truffle flavor in this hummus. We suggest adding the truffle oil last, in small amounts and keep tasting it until you get the flavor you like. Then use olive oil to make the oil equal 1/2 cup in total if you have not used 1/2 cup of truffle oil. What is a good substitute for tahini in a hummus recipe? Tahini is a sesame paste. I don’t know what it is about the tahini that makes hummus taste so much better than without, but it does. I think it gives it that buttery taste that I love so much. If you can’t find tahini, you can substitute with a little sesame oil (about 1 tsp only though), however your hummus wont have the same buttery flavor. Still good though… I promise. get out your food processor and all your ingredients. blend it really well or your desired smoothness. I like mine pretty smooth but with maybe a few little chunks here and there. you can also add a little water if your hummus isn’t thin enough. I often add a tablespoon or so of water to my hummus. 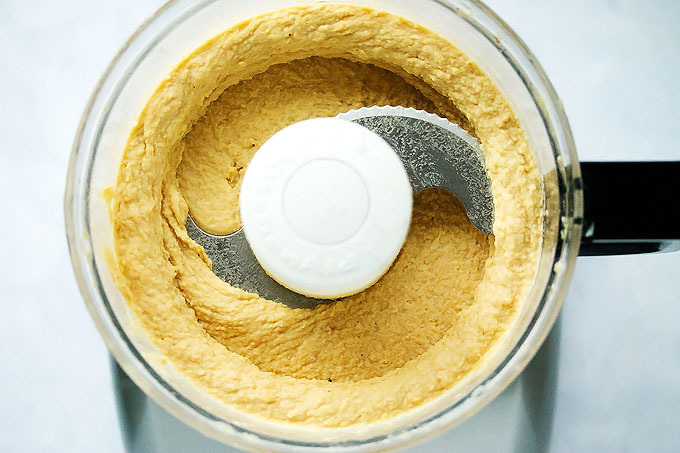 Can you make hummus in a blender? Absolutely! Just follow the same instructions, but just in your blender. It helps to have a high powered blender like a blendtec (like I have) or a vitamix (like Debbie’s), but you can likely use any blender. You might need to use a little water with some blenders to get things moving a bit. bake them at 350 degrees for 6 or 7 mins. Let them cool before serving. Tip: for extra truffle flavor, drizzle a little truffle oil over the pita chips! Yum. 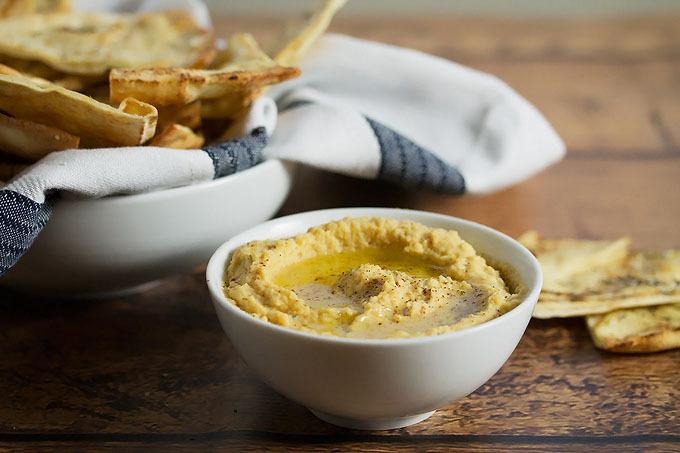 Just a couple party food ideas and a few suggestions for serving this hummus at a party. onion, pear and prosciutto puff pastry tarts – one of our favorites for sure! hot onion and gruyere dip – my favorite dip in the whole world! espresso martini – just in case anyone needs a pick me up, this one works like a charm! If you’ve tried this truffled hummus recipe then don’t forget to rate the recipe and let us know how it turned out in the comments below. We love hearing from you! 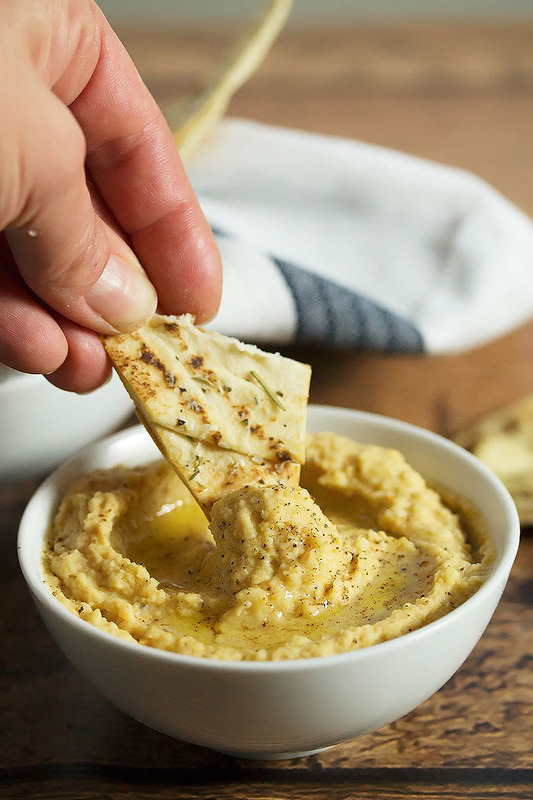 Sophisticated but easy homemade hummus dip with garlic, a little lemon, and plenty of truffle oil. It's like no other hummus you have tasted and you will never want it any other way! Put all ingredients (but only half of the truffle oil to start) for the hummus into a food processor. Blend well until smooth. You might have to keep scraping down the sides. Taste it and either add the rest of the truffle oil or use olive oil instead if your hummus is very truffly. Season to taste with salt and pepper. Spread out the pitas and brush olive oil over both sides. Cut the pitas into 8ths and place on a parchment lined baking tray. Sprinkle with the salt, garlic powder, herb de provence and the parmesan cheese. Bake for 6 or 7 mins and remove from the oven. Let them cool slightly before serving. Looks amazing, ladies!! I love truffled anything. Pinned! Thanks Natasha, we do too…! Such a smart idea!! I know this must taste amazing… I love truffle oil! Isn’t it great to have friends take care of you when you need? And now that you’re in your home (yeeeee!!) and your beautiful new kitchen is in working order, it must be fun returning the favor! Perfect timing, for the holidays!? Delicious recipe ladies!